In News: In today’s world of manufacturing raw materials are taken from the environment, turned in to new products which are then disposed after use. This is a linear process with a being and an end and in this process limited raw materials will eventually run out. Also, waste accumulated in this process incurs additional expenses related to its disposal and pollution. Waste becomes a resource: All the biodegradable material returns to the nature and the not biodegradable is reused. Reintroduce in the economic circuit those products that no longer correspond to the initial consumers’ needs. Reuse: Reuse certain products or parts of those products that still work to elaborate new artefacts. Reparation: Find damage products a second life. Recycle: Make use of materials founded in waste. Valorisation: Harness energy from waste that can’t be recycled. 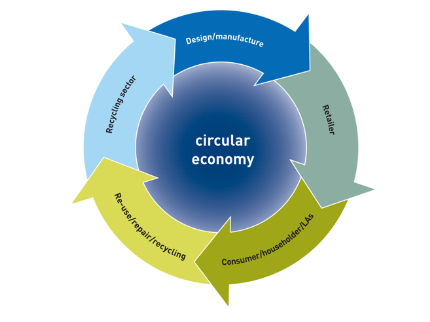 Functionality economy: Circular economy aims to eliminate the sale of products in many cases to establish a system of rental property. When the product completes its main function returns to the company, where it is dismantled for reusing the valid parts. Energy from renewable sources: Elimination of fossil fuels to produce the product, reuse and recycle. Eco-design: Considers and integrates in its conception the environmental impacts throughout the life cycle of a product. Industrial and territorial ecology: Establishment of an industrial organizational method in a territory characterized by an optimized management of stocks and flows of materials, energy and services. At the heart of the Paris Agreement is a goal to keep global temperature rises well below 2˚C. The popular action area is around energy – both energy efficiency and renewable energy. Is there really gold in solid waste and wastewater? It is a criminal waste of energy, effort and cost to use fresh potable water for construction, watering landscaped areas or even for flushing the toilet. Using recycled greywater (from our showers and sinks, for example) or blackwater (the water flushed from our toilets) for these applications would reduce the need for freshwater, eliminate water scarcity and ensure that our bodies of water do not continue to be dumping grounds for solid waste, treated or otherwise. The nutrient-rich fertiliser obtained in the wastewater treatment process can be used for agriculture and is a welcome by-product. Back of the envelope calculations indicate that India could save more than $1.4 billion in foreign exchange and subsidies each year only from the fertiliser obtained and also meet more than 10% of its water requirements through recycling. Who would have thought there would be? What would it mean for India? Repairing is part of the DNA of developing countries. Several building blocks of circularity are deeply ingrained in Indian habits, as exemplified by the high rates of repair of vehicles and the distributed recovery and recycling of materials post-use. Often handled informally, these activities provide the only source of livelihoods to some of the world’s poorest populations. By turning these existing trends into core development strategies, India could generate significant economic savings and massively cut down on carbon emissions. Although all these measures have potential it’s unlikely they are enough to provoke the sort of radical changes in patterns of consumption and production required. Discuss. 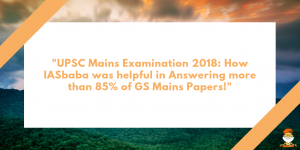 82+ UPSC CSE 2018 TOPPER'S from IASbaba, ILP Programme scores a grand Success! !